I have no idea how this picture will end up looking full size. It looks pretty lousy on my phone. 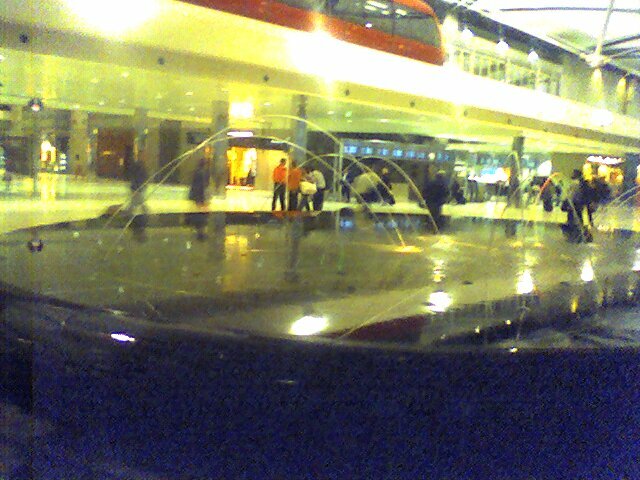 I'm back in the Detroit airport and have 3 hours to kill so I figured I'd wander back to that fountain I saw a few days ago. I made the mistake of listening to my stomach and grabbed some sushi first, so it was again getting dark by the time I wandered by the fountain. Not the best conditions for my low-res camera. Oh well. 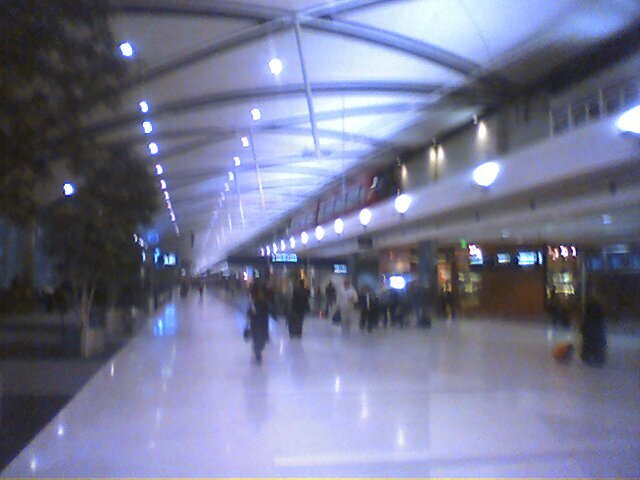 Here's a picture that hopefully shows the look of terminal A which I had attempted to describe earlier. The monorail can be seen in the upper right. I really like the new movies-on-demand they now have on NWA international flights. You get to watch any of the movies at any time. While I didn't watch anything on my overnight flight to the UK (I tried to sleep), on the flight back to the US I got to see three films I had missed in the theatres: The Incredibles, Finding Neverland, and A Series of Unfortunate Events. It definitely made the flight time pass quickly. I'm not usually one to watch movies by myself (I feel like I should be doing something else) - which is why I missed these in the theatre - so this flight was a good opportunity to catch up on some recent films. Of the three films, I liked Finding Neverland the best - it had the biggest emotional impact of the three. The Incredibles was good light fun and the computer animation was impressive. I didn't care for A Series of Unfortunate Events very much. It seemed soulless - the unfortunate events (such as people being murdered) were handled so lightly and without much reaction from the main characters it left me cold and uncaring. I suppose since it was a children's film the deaths had to be lessened in their emotional impact, but it seemed they went to far - making it all too detached emotionally. Thanks for sending me the link! Glad you had a good trip and I enjoyed the Pics.